The famous Spanish surrealist painter, Salvador Dali had artistic repertoire that included sculpture, painting, photography, multimedia work, and collaborations with other artists, most notably independent surrealist films. 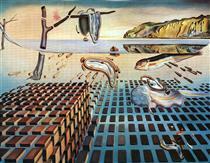 Dali was born in a quasi-surreal existence. 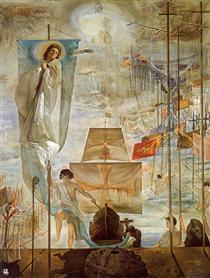 His brother, also named Salvador, died as a toddler, nine months before Dali’s birth. His parents told him he was the reincarnation of his older brother, which he also came to believe. As a child, Dali attended drawing school, and by the age of thirteen, Dali’s father was arranging exhibitions of his charcoal drawings. In 1922, Dali went to study at the School of Fine Arts in San Fernando, where he was known as a bit of a dandy, wearing long hair and sideburns, and stockings with knee breeches in the style of 19th century aesthetes. 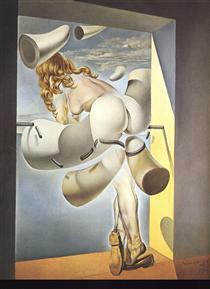 During his stay at the academy, Dali tried his hand in cubism and dada. But his stay was short lived, after he was expelled a few weeks before final exams, for stating that no one in the school was qualified enough to examine him. After his expulsion, he traveled to Paris, where he met Pablo Picasso and Joan Miro, who heavily influenced his painting styles. 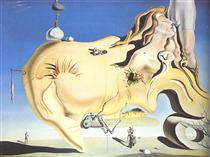 Dali continually borrowed from many painting styles. From impressionism to renaissance works, he combined all elements into single compositions, raising interesting critiques from art critics, who were unsure as how to received his works. 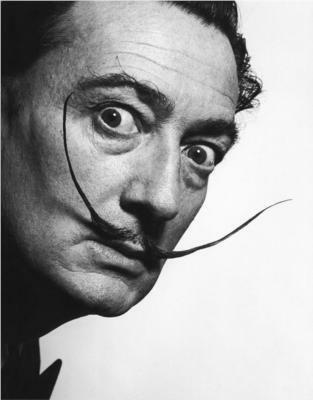 Always a dandy, Dali grew a large moustache, which was a trademark of his appearance for the rest of his life. In 1929, Dali began a relationship with the woman who would later become his wife, Gala. His father disapproved, and saw his connection with surrealism as a demoralizing influence on his son. Upon hearing reports that Dali had created a work with an inscription insulting his mother, who had died eight years earlier of breast cancer, the elder Dali disowned and disinherited his son, telling him never to return home. Dali then married Gala and moved into a house at Port Lligat. Dali spent the middle and late years of his life between the United States and his beloved Catalonia, Spain, collaborating with other artists, canoodling with social elites, and creating many stories for the newspapers. 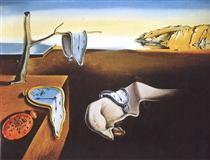 After his wife’s death in 1982, Dali lost much of his will to live, and purposely dehydrated himself almost to the point of death. There was also a mysterious fire in his apartment in 1984, from which he was saved, but many thought was a suicide attempt. He died of heart failure five years later at the age of 84. Salvador Domingo Felipe Jacinto Dalí i Domènech, Marquis of Dalí de Púbol (11 May 1904 – 23 January 1989), known professionally as Salvador Dalí (/ˈdɑːli, dɑːˈli/ Catalan: [səɫβəˈðo ðəˈɫi]; Spanish: [salβaˈðoɾ ðaˈli]), was a prominent Spanish surrealist born in Figueres, Catalonia, Spain. Salvador Domingo Felipe Jacinto Dalí i Domènech was born on 11 May 1904, at 8:45 am GMT, on the first floor of Carrer Monturiol, 20 (presently 6), in the town of Figueres, in the Empordà region, close to the French border in Catalonia, Spain. In the summer of 1912, the family moved to the top floor of Carrer Monturiol 24 (presently 10). Dalí's older brother, who had also been named Salvador (born 12 October 1901), had died of gastroenteritis nine months earlier, on 1 August 1903. His father, Salvador Dalí i Cusí, was a middle-class lawyer and notary whose strict disciplinary approach was tempered by his wife, Felipa Domenech Ferrés, who encouraged her son's artistic endeavors. When he was five, Dalí was taken to his brother's grave and told by his parents that he was his brother's reincarnation, a concept which he came to believe. 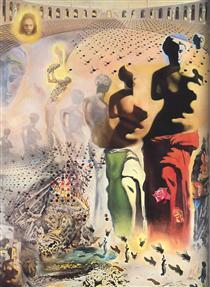 Of his brother, Dalí said, "[we] resembled each other like two drops of water, but we had different reflections." He "was probably a first version of myself but conceived too much in the absolute." Images of his long-dead brother would reappear embedded in his later works, including Portrait of My Dead Brother (1963). Dalí also had a sister, Anna Maria, who was three years younger. 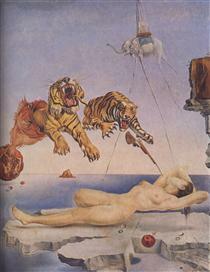 In 1949, she published a book about her brother, Dalí as Seen by His Sister. His childhood friends included future FC Barcelona footballers Sagibarba and Josep Samitier. During holidays at the Catalan resort of Cadaqués, the trio played football (soccer) together. Dalí attended drawing school. In 1916, he also discovered modern painting on a summer vacation trip to Cadaqués with the family of Ramon Pichot, a local artist who made regular trips to Paris. The next year, Dalí's father organized an exhibition of his charcoal drawings in their family home. He had his first public exhibition at the Municipal Theatre in Figueres in 1919, a site he would return to decades later. In February 1921, Dalí's mother died of breast cancer. Dalí was 16 years old; he later said his mother's death "was the greatest blow I had experienced in my life. I worshipped her... I could not resign myself to the loss of a being on whom I counted to make invisible the unavoidable blemishes of my soul." After her death, Dalí's father married his deceased wife's sister. Dalí did not resent this marriage, because he had a great love and respect for his aunt.